Tyler and Whitney Shaw and Grady Shaw, of Walker, are proud to announce the birth of their daughter and sister, Lyla Paige Shaw. Lyla was born on April 6 at 8:40 at Nevada Regional Medical Center. 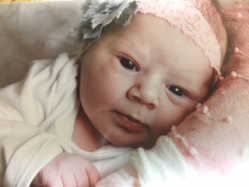 She weighed 8 pounds, 5 ounces and measured 21 inches. Maternal grandparents are Brent and Sandra Gundy, Walker. Maternal great-grandparents are Chuck and Linda Gundy, Walker. Paternal grandparents are David Shaw, Milo, and Sherry Shaw, Nevada. Paternal great-grandparents are Lula Shaw, Bronaugh, and Bill Erwin Sr., Nevada.